This is a sample permission letter for the schools to get parental consent to get their children to school trip. This content can be modified as per your own info. This space can be used for School Letter Head and or logo. As a part of our study of the History of Indian Subcontinent, we will be taking a field trip to the famous monuments built in 19th century in Peshawar. We will leave shortly after school starts, and we will take a bus together to Peshawar. 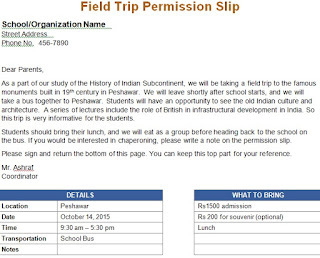 Students will have an opportunity to see the old Indian culture and architecture. A series of lectures include the role of British in infrastructural development in India. So this trip is very informative for the students. Students should bring their lunch, and we will eat as a group before heading back to the school on the bus. If you would be interested in chaperoning, please write a note on the permission slip. Please sign and return the bottom of this page. You can keep this top part for your reference. I give my permission for _____________________________ to participate in the field trip.